It seems like people are talking a lot about chemtrails these days. Most people usually also want to know what cloud seeding is and if the two concepts are related. Is any of the chemtrail conspiracy true? Just what is cloud seeding? And what else is going on up in the sky that we should know about? I dug around for the answers, and here’s what I found. Q: Are chemtrails a hoax? Over the last few years, a lot of people have been talking about chemtrails — what some people call the white lines in the sky that follow behind aircraft. Let’s debunk chemtrails as nothing more than a popular hoax right away. Those white streaks in the sky are called contrails, not chemtrails, and they have existed since the time we’ve begun flying planes high into the atmosphere. Chemtrails are only the creation of conspiracy theorists who believe that certain organizations are spraying chemicals into the atmosphere for any number of possible malicious purposes. By the way, chemtrails are very much unlike cloud seeding. Cloud seeding is the process by which weather scientists drop dry ice or silver iodide into clouds to induce precipitation, but I’ll explain more about that in a bit. Contrails are formed by water condensation from planes flying at very high altitudes — 5 to 10 miles up. However, the chemtrail proponents claim that biological agents are hidden in these contrails. That, they say, explains why certain contrails linger for a longer period of time than others. 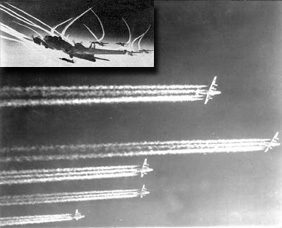 In fact, contrails can last for many hours, and have done so since the time of early high-flying planes during World War II. Photographs from WWII provide evidence of that. Long-duration contrails can be traced back to at least 1921. Contrails are streaks of condensed water vapor caused by high-altitude planes and rockets. Contrails form when hot, humid air from aircraft engines mix with colder surrounding air. 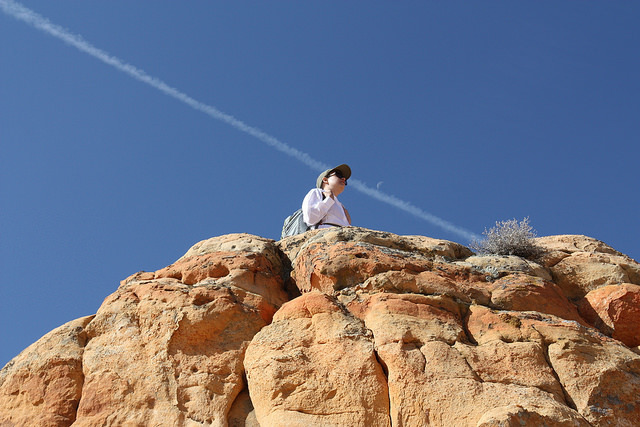 Contrails dissipate at a rate contingent on weather conditions and the altitude of the contrail; contrails disappear faster in drier air than in humid conditions. Contrails often spread into cirrus sheets, which occur as ice crystals of different sizes descend at various speeds are then carried horizontally by wind shear, causing the cirrus formation. Q: What is cloud seeding? A: It’s a way to artificially change the weather. Cloud seeding is performed by spreading dry ice or silver iodide aerosols into the tops of clouds to help start the precipitation process and cause rain. The first major cloud seeding experiments were conducted in 1946. The thinking behind using ice crystals to stimulate rainfall is that rain usually forms from the growth of ice crystals in super-cooled cloud droplets in the upper regions of clouds. So, the silver iodide crystals are likewise used to spur the growth of new ice crystals. Cloud seeding is different from what conspiracy theorists claim chemtrails are. While cloud seeders drop harmless crystals into clouds to create rainfall, chemtrail proponents think certain organizations are creating clouds filled with harmful agents. It seems that scientists are largely unclear to what extant cloud seeding is actually productive. One major reason the science community is unsure as to whether or not it’s possible to make rain is because the clouds that are seeded may have rained anyway. The results are also muddy because seeding is usually performed on clouds that already appear to have rainfall potential. 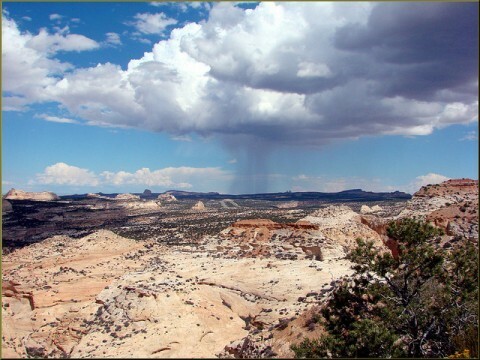 Scientists theorize that cloud seeding may have an overall effect of increasing precipitation chances from 5% to 15%. At this point, scientists are unsure if they should expand cloud seeding programs to help change the weather.